Solution Saddles Customer Stories: The SMART™ Eventer saddle fits all of Rachel's horses, including her rare breed Boulonnais Draught Horses. The SMART™ Eventer saddle fits all of Rachel's horses, including her rare breed Boulonnais Draught Horses. "After the theft of all my tack, I was forced to replace numerous saddles. I own three rare breed Boulonnais Draught Horses that require short, very wide saddles, a Connemara and a Polo pony; to replace all of their saddles was going to mean a huge financial outlay. My riding instructor recommended the SMART™ Eventer saddle for me and I just wish I had one in my life earlier! It fits all of my horses, from my heavies to my fine Thoroughbred types and is also the most comfortable saddle I’ve ever sat in – my seat bones will forever be grateful. In addition, it has revolutionised my riding. My horses feel freer and our communication has become fine-tuned; I can feel them and they can feel me. 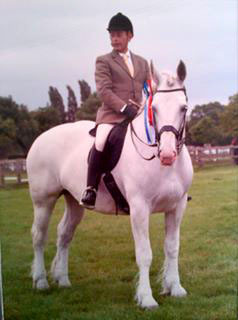 One of my Boulonnais mares, Sophia, recently took part in her first show, ridden by Dan Hammond, and was the World Breeds’ Ridden Reserve Champion. 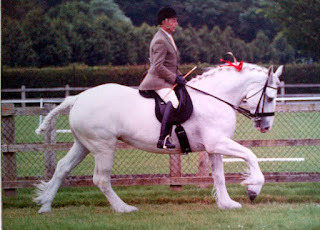 Dan would now like to qualify Sophia to the British Dressage Draught Horse Championships. Finally – this summer we had the first ever UK-born Boulonnais Draught foal (as seen in Horse & Hound), who we are watching closely to become the only breeding stallion in the UK. He will be broken and ridden away in my new ‘couldn’t-be-without’ SMART™ Eventer saddle! There are only 13 Boulounnais Draught rare horses in the UK and 1,000 known worldwide!"